Coming off the successful launch of his debut album Jewish Folk-Rock Artist Moshe Hecht gave CrownHeights.info an exclusive interview, dishing on a variety of topics from who he hoped would listen to his music, to what his inspiration is. Read the full interview and listen to a CD sampler in the Extended Article. CrownHeights.info: What about the album are you most proud of? Moshe Hecht: Growing up, listening to most albums was like hearing one long song—not so much diversity. With “Heart is Alive,” I strived to create twelve songs that were each completely unique in sound and style. I went so far as to work with three different producers; Alon Cohen of Twelve Tribe Sound, Jake Antelis of Jantelis Productions and seven-time Emmy-winning, Grammy-nominated producer Steven Ray Allen. I feel really lucky that these incredibly seasoned producers were able to translate my vision. CHI: How do you think you stand out on the Jewish music scene? MH: There’s a lot of incredible Jewish music surfacing these days. Maybe I will stand out because my songs are original compositions written through various stages and travels in my life, so they’re very personal and expressive. Although I draw inspiration from Jewish artists like Shlomo Carlebach and Isaac Bitton, the sound is completely different and new. Also, my music is not solely about entertaining but about inspiring others to realize their spiritual potential. From my lyrics and melodies, I believe people will sense that. CHI: What is the highlight of your singing career so far? MH: I’ve had some great concerts traveling around the States and other countries, but I think the best times were when I was in Israel after I got married. I was learning and teaching, but also anxious to sing and perform. I met musicians trying to earn a buck in the streets and before you know it, they learned my songs and we were we’re performing in Jerusalem music venues. When you’re trying to create spiritual music, there’s no better place to be than in the Holy Land. But Brooklyn rooftops in the winter also aren’t that bad! CHI: Tell us something surprising about yourself. MH: I am one of fourteen children and I think it’s fair to say that most of my siblings are tone-deaf! CHI: Who would you like to listen to your music? What are your goals? MH: My late grandfather Chaim Gutnik was in Yechidus with the Rebbe one time and hesitated to report about a Taharas Hamishpacha class the Rebbe had encouraged him to start. But when the Rebbe inquired, my grandfather had no choice but to tell him what a failure the class was because only one woman showed up. The Rebbe responded, “And how many mothers did Moshe Rabeinu have?” The point of this story is that you can change the world through positively affecting just one person. If my music can do that, then I’m a happy man. That’s the way to do music, big inspiration Reb Hecht! loooking 4ward to learning with u shabbos morn. please explain me why is this something lubavitch chassidim need to embrace? what is Chassidish about his music? We as chassidim are losing touch with our tachlis of being chassidim. and also the band is so hawt!!!! 6, yours is the attitude that produces Chabad-Lite. This is obviously not for people who are satisfied with Avraham Fried and MBD and who consider Lipa about as alternative as it gets. I’m one of them and I don’t even pretend to understand or appreciate this type of music no matter how many times I listen to the sampler. On the other hand, I do appreciate that a lot of talent and creativity went into this album. 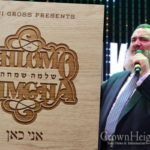 Many people will respond to the message of this music, which is a very kosher one, because they feel more comfortable listening to Moshe than to the mainline “Chassidish” singers. We are here to bring people to Yiddishkeit, regardless of whether they like niggunim, or rap, or this type of alternative music (I don’t even know what it is called). That is because we are here for all Jews, everywhere, all the time. Luv it brother…Have a wonderful Shabbos and a great year!!! !